Vanilla Press Cookies are a classic press cookie. One reason: versatility. The buttery dough is pushed through a cookie press to form the cookies. You can change the cookie press disks to produce different cookie shapes, depending on the season or occasion. 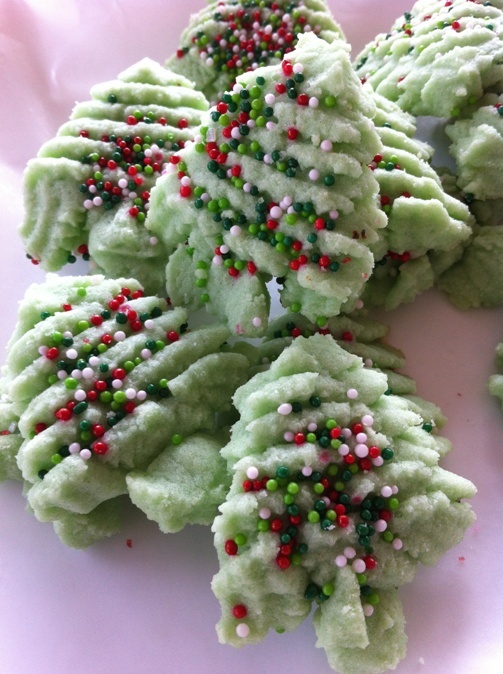 You can serve these cookies plain, sprinkled with decorations or sugars, frost them, or dip them in melted chocolate. Press cookies are fun! Add food coloring to dough as desired. You may wish to separate dough and color it in two or more batches to make a variety of cookies. Prepare cookie press by selecting and inserting a disk and filling the press with dough. Press cookies onto the baking sheets, about 1 inch apart. Decorate cookies with colored sugars and sprinkles. Vanilla Press Cookies are festive at Christmas time when dough is colored green, pressed using a tree-shaped disk, and decorated with colored sprinkles to imitate Christmas trees.